There is a real problem with escalation in Shonen anime. Unless you’re telling a shorter form story with a definite end in mind from the beginning, there ends up being this constant need to top yourself. As the heroes gain the strength to defeat the evil threatening them, it means the next enemy to come along needs to be just that much stronger, and them some. Goku had to fulfil a legendary alien prophecy to gain the power to defeat Freeza, and that was just the tip of the iceberg. By the time Z ended, Goku and the gang were fighting the living embodiment of chaos: a threat to the entire universe. When you’ve got the guardian of the entire universe coming to you asking for help, there isn’t much more wiggle room to up the stakes anymore. You end up feeling like you’re just moving sideways, much like what I feel like happened in GT. Super somehow managed it though, they introduced an entirely new hierarchy of Gods and Angels, creating even higher plateaus of strength for Goku to achieve. Beerus was a fantastic measuring stick that gave Goku somthing to strive for again, one he hasn’t clearly beaten to this day. It wasn’t just Beerus though, the establishment that our universe was just one of 12 opened up a whole slew of new possibilities. 12 collections of realities filled with people of completely unknown strengths and power. While most of these universes ended up paling in comparison to Goku and Vegeta when the Tournament of Power rolled round, there were still a few individuals who proved to be very powerful foes. On top of that, there are still four universes we haven’t seen at all. And these universes happen to be the most powerful of the lot proved by their exclusion from the Tournament of Power. Potentially anyway. Super stirred up the pot and showed that the franchise was not going to feel constrained by the events that came before. Not only that, the series ended with many new doors opened and the potential for a ton of new stories in the newly established multiverse. Dragon Ball Z’s original run, like most weekly Shonen, had a reputation for filler. Some of it good, a lot of it pretty bad. For those of you who don’t know what I’m talking about, the weekly release schedule of these anime meant that they often started to outpace the release of the manga they were based on. The solution to this was that the animation studio added minor new elements to events to drag them out, or would sometimes invent entirely new story arcs that would act to pad out the anime and give the actual story of the manga time to catch up. We’re talking about things like Goku falling off Snake Way, visiting the fake Namek and the Garlic Jr. arc, that type of thing. Super didn’t have filler in that same respect, as it was released before the manga anyway. But they did still add a handful of episodes that took place between the major story arcs, episode which acted a breathers between the main story, often being lighter in content and of tone. A little more slice of life than dice with death. The reason I got so happy about filler here is because they often played with the goofier aspects of the franchise that really touch upon what Dragon Ball was when it first got started. The silly episodes were always a welcome distraction to come after a combat heavy finale to a particular story arc. And there are a lot to look back at and smile in Super. Goku fighting Beerus in a giant mascot costume of a fighter he had invented to try and motivate Goku. At the same time as Vegeta and Piccolo trying to hide the fact it was Beerus from a totally clueless Goku. It’s dumb in a really fun way. 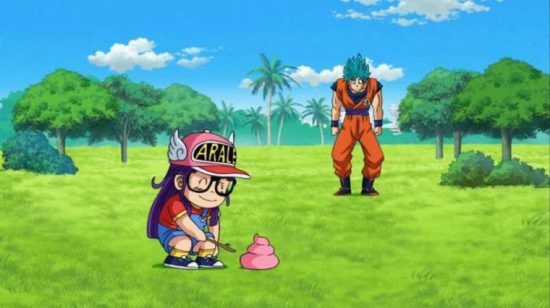 Then you have the episode bringing Arale back, a gag character who all of the characters in the show seem to very self aware about. Maybe the best one for me though was the few episodes centred around Gohan. A story which focuses on him juggling being a stunt man for the Great Saiyaman movie, a jealous lead actor who has a thing for his wife and cluelessly dealing with the advances of an idol co-star. It’s one of the few times we get to see the doofy Gohan again from back in Z, as well as the only time we get to see Videl be a badass again. These episodes are always a nice reminder that Dragon Ball isn’t always about changing hair colours or universal threats. Universe 6 was the series’s first glimpse into the greater multiverse that Dragon Ball now found itself taking place within. This glimpse gave hints at the new possibilities for potential stories. Cabba and Vegeta’s relationship established a potential future for the Saiyans that Vegeta had thought was lost. And their student/mentor relationship was the jumping off point for a fantastic piece of development for Vegeta as a character too. Here’s contentious opinion for you; I really Like Caulifla and Kale. 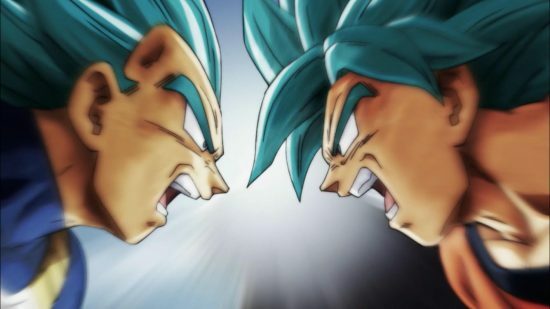 The more vocal fan base were very critical of the two female Saiyans for their transformation into a Super Saiyan 2 minutes after learning it was a thing and their similarities to Broly respectively. But by at this point in the series, we’d seen Freeza receive a huge power boost after only a few months training, and I’ve already mentioned Trunks’s collection of miracles in the Goku Black Arc. I had given up questioning where people got their power from and just started enjoying the show, and felt it was a good move. The dynamic between Caulifla and Kale was great, while their growth and character arcs primarily exist in a vacuum, just between the two of them, it was great to see two brand new characters get some story and focus. I loved Kale’s development in the brief time the character was shown, I hope the two continue to factor into the series and their parallels to the Saiyans of Universe 7. Even taking their development off the table, the pair brought some of the best action scenes to the arc. I got a real kick out of Kale’s berserker freak outs, as a person who doesn’t especially like the Broly character. But their fight against Goku was their real highlight. It was one of the best in the entire arc in terms of both action and animation, it was the point where the show really started to look amazing from that standpoint. And their final defeat as Kefla by Ultra Instinct Goku came as a result of one of the best single moments in the entire series for me. I haven’t even gotten into Vados, Hit or Champa’s relationship with Beerus, but I think you’d guess what I’d have to say at this point. I want more Universe 6 in the future! 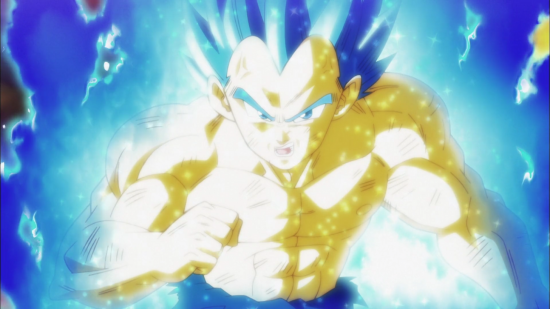 While I complained about Goku’s character development, with him almost going backward in my previous post, Vegeta has more than made up for that by coming leaps and bounds as a character in Dragon Ball Super. Beginning with the infamous Bingo scene in Battle of Gods, then to his mentorship of Cabba of Universe 6, to the birth of his daughter, and ending with his monologuing to both Toppo and Jiren during the Tournament of Power. He’s a completely changed man from the days of his introduction into the franchise. What makes his journey so great is its been such a gradual one that he has always felt like the same character. 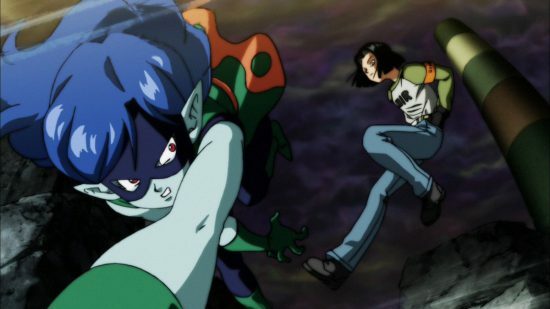 His development throughout both Z and Super have been gradual and while the Prince continues to be a gruff, stubborn and occasionally merciless individual, it’s obvious that he has gained strength from the connections he’s forged to his family and the people he would never admit to calling friends. He is still a man of pride, but now it isn’t just individualistic and selfish. It extends to his wife, his children, his universe and even his once bitter rival Kakarot. That pride pushes him forward, like it always had, but he just views it in a different, healthier way. It extends to him lecturing Toppo for giving up on his pride in justice and why he ultimately lost to Vegeta as a result. His relationship with Cabba is a huge growth point for him too. While never openly admitting it, he takes the role of a mentor to the young saiyan, helping push him to new heights when they fight with one another. His gruff and standoffish mentorship, one he shares with Future Trunks’ also shows his growth. Even his desire to win the Tournament of Power shifts from a simple goal to prove he is the best to unselfishly wish back the Saiyans of Universe 6. Goku might be the main character of the Dragon Ball franchise, but Vegeta is probably its best. 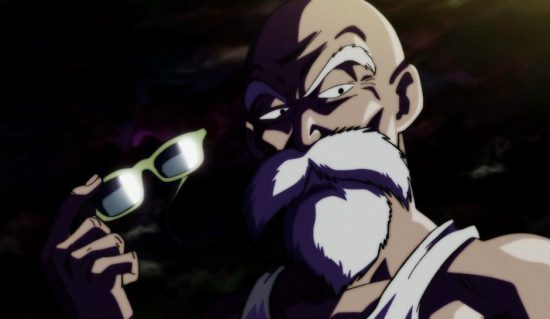 Of all the characters who made their debut in the original Dragon Ball, the one I would have never expected to get significant character development during Dragon Ball Super was the turtle hermit himself; Master Roshi. But low and behold the old coot got one last hurrah. Roshi always filled a particular anime stereotype of the wise old mentor figure, who also happened to be a raging pervert. He was Goku’s first martial arts teacher, and as a result was the first one Goku surpassed, doing so before the original Dragon Ball was even half over. At this point the character became little more than comic relief or the occasional machine to dump exposition, a role many characters fell into as time went on. His inclusion in the roster for the Tournament of Power felt like an odd choice, on paper we was the weakest member of the ten. But not only did the wily old devil prove himself a valuble asset during the tournament, he was also one of the few characters that actually grew as a result of it. 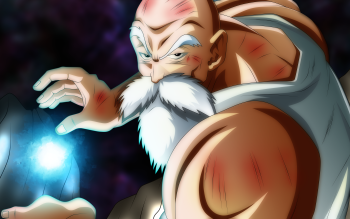 Leading up to the Tournment, Roshi seemed to be taking it unusually seriously to the point that he identified his biggest flaw as a fighter and a person, then he worked to remedy it in time for the tournament. In this case, it was his perverted nature that could potentially lead to his team’s elimination. So he went off to get over his issues, in way that was meant to be comedic, but still comes off pretty creepy. By the time he was in the tournament, his unique fighting style and the set of techniques available to him meant that pure strength was much less of a factor and he ended up eliminating a fair number of their opponents before giving a heroic speech to his former students and breaking through his limits in his own way. He proved himself to both the audience and to Beerus who gave him that sought after thumbs up. Way to go Roshi. 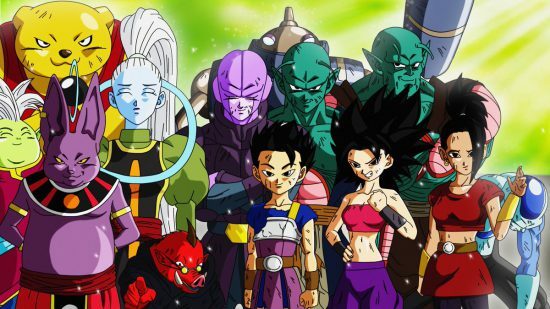 The Universe Survival arc brought a surprising number of characters back into relevance, ones we had assumed had come and gone, their time within the limelight passed. 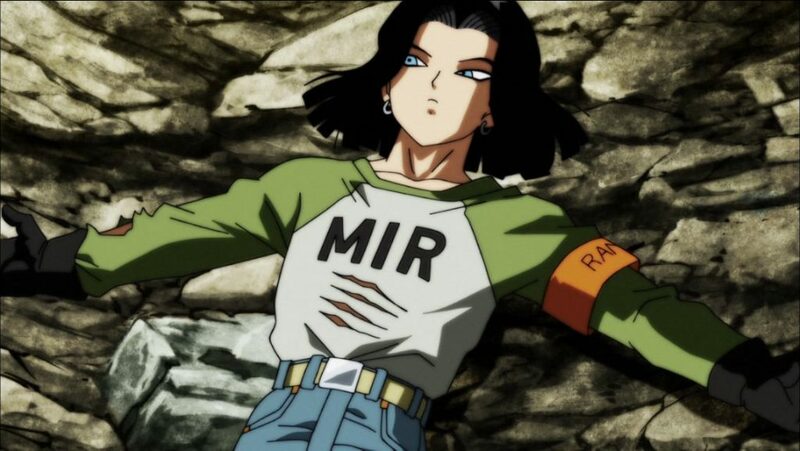 None of which was more surprising in the impact they had on the tournament itself, but also amongst the fanbase that the lackadaisical return of Android #17. #17 was absolutely fantastic in Dragon Ball Super. Initially seeing him back on screen was pretty cool, many of us just assuming he would do most of his work in conjunction with his sister #18. But he went above and beyond to become one of the highlights of the entire arc, maybe the entire series. #17 always had this “too cool” air about him back during Z, like things never flustered him and showing emotion was too much effort. This ended up coming across as overconfidence, when the cracks started to show shortly before he was absorbed by Cell. He apparently spend the following decade working on his poker face, because during the Tournament of Power, he is nigh unflappable. His and his sister’s unlimited stamina, thanks to their nature as cyborgs (which is what they are, in spite of their names), and #17’s unique ability to project powerful barriers over himself and allies made him a hugely valuable asset to the team, not to mention the unexplained power boost he gained in the time since we saw him last. I can forgive this though because #17’s attitude throughout this entire tournament is so laid back, he is unfazed by pretty much anything that happens throughout the arc that it’s borderline hilarious. That isn’t to say he lacks any fun to him as a character. He plays up the “villain” role when fighting Ribrianne, who is a spoof of the magical girl trope. Which is pretty funny. It’s not until the ending stages of the tournament that we realise how much heavy lifting #17 actually does to contribute to Universe 7’s ultimate victory. 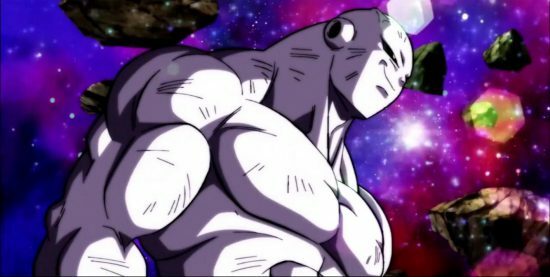 During the closing stages of the fighting, he is a huge asset towards taking Anilaza, Toppo and even Jiren. This all culminates in his final sacrificial act, blowing himself up to prevent Jiren from eliminating Goku and Vegeta from the tournament with a wistful sigh about not getting that cruise he wanted. And a handful of episodes later, when things look their worst, the guy crawls from the ashes with a shrug. Had it been anyone else, this would have really cheapened the sacrifice, but at this point I was all in and laughed out loud despite myself seeing the guy was still alive, because of course he was. Then to top it all off with a nice little bow, when Goku and Freeza finally take out Jiren, Android #17 is the final person left standing and the defecto winner of the whole Tournament. Even had he not been the last man standing, he would have been my personal MVP. It was great seeing #17 back and he was used to fantastic effect. There were a huge amount of new characters introduced during Dragon Ball Super. 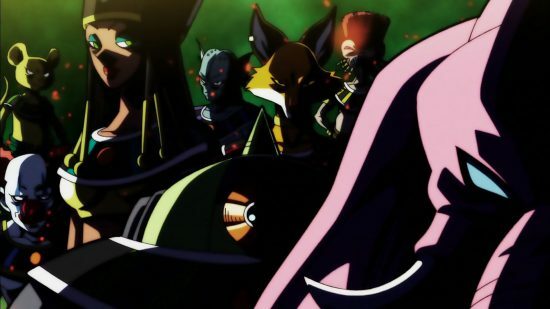 The Tournament of Power itself had 80 combatants, and that’s in addition to the God’s of Destruction, Supreme Kai and Angels of all 12 universes present. Of all the new characters introduced though, the one that stands up as one of the most memorable for me Toppo. During the build up to the tournament, we got some insight into the other universes and how they were reacting to a potential end to their existence. I made many of the combatants sympathetic, even likeable. Aside from Universe 6, Universe 11 was the other standout. A technologically advanced universe, policed by a team of flamboyant, lycra clad heroes called the Pride Troopers, with Toppo leading them. There is a lot to like about Toppo. His design is fantastic for one. He has this huge walrus moustache, tiny legs and massive hands, his proportions are all over the place, but what makes Toppo so memorable is his attitude. 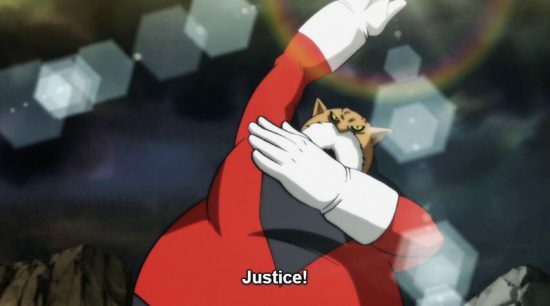 Toppo is a man dedicated to justice, so much so that he is always striking poses and adding the word “Justice” to every attack with a boisterous enthusiasm. He is a good guy, maybe a better guy than any of our heroes in Universe 7. Aside from his design and characterisation though, he received a pretty great arc. Toppo is established as being incredibly powerful right off the bat, able to go toe to toe with Goku in his Blue form. Additionally he is a candidate to be the next God of Destruction of Universe 11 when Belmond retires/dies. Something Toppo himself seems very resistant to, which is totally juxtaposes his chosen justice lifestyle. His story comes to a head towards the tail end of the the tournament, he is being knocked around by Android #17 and Freeza, being antagonised heinously by the later. 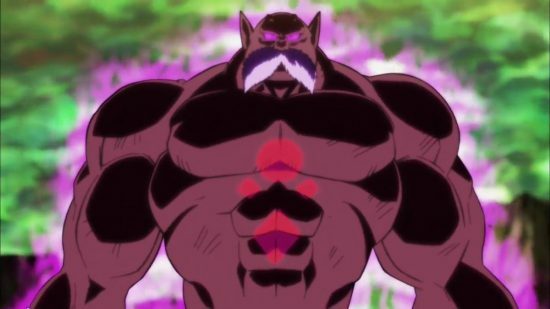 Truth be told, I was rooting for Toppo, as Freeza berates him for his dedication to good, and it’s here Toppo gives up on justice and takes on the power of God of Destruction to fight back. He gains immense power as a result, and the ability to destroy as the Gods do. He suddenly becomes a much bigger problem than Jiren, it take’s Vegeta’s admonishing for giving up on his pride to ultimately bring him back to his senses. Via a defeat of course. The shift from Toppo’s antagonism to him becoming the first member of Universe 11 to really understand why Universe 7 are so powerful is a great moment. While his own universe is on the verge of destruction, he still comes to respect the Saiyans and what they stand for and the bonds they have forged that make them so powerful. It’s the reason he ultimately reaches out towards Jiren to give him the chance to break away from his solitude. Toppo is a fantastic character and I’d love to see more of him and Universe 11 in the future. 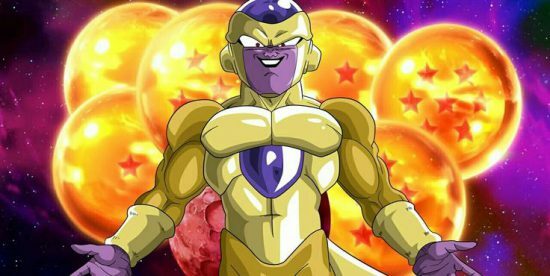 I was happy to see Freeza return in Ressurection ‘F’, bringing back the franchise’s most iconic villain and making him relevant again was a great move. Even though their reasoning for his power up was kind of weak. That eventually stopped bothering me though as weak justifications for power ups became common throughout Super. The surprise though, was that Toei and Toriyama weren’t done with Freeza after the events of that movie. In a swerve from them, they faked the audience out by making us think Majin Buu was going to be a part of the Tournament of Power, only to bring the galactic tyrant back for round three. And the extent to which his inclusion succeeds cannot be understated. Freeza contributes to the arc hugely in terms of his actions but also his presence as a wildcard mixed up in events. For most of the arc he very obviously has his own motives, and the changing nature of the tournament makes it so you really can’t tell what he’s going to do at any given moment. The writers play with that fact to an amazing effect, keeping both the characters and the audience on their toes at all times. In Goku’s huge entourage of friendly former enemies, Freeza was always the one character who seemed absolutely irredeemable, he was and still is totally rotten to the core. Toei seemed to make it their personal mission to redeem the irredeemable. And they kind of did. They don’t do anything to change Freeza’s character, but his need to survive and the situation he is in forces him to align with Goku and it fleshes out the pair’s already complicated relationship. The way the tournament ends, with the two old enemies teaming up, and fighting surprisingly well together, far better than Goku and Vegeta ever did. There is something weirdly cathartic about it all. It made for a fantastic ending to the series and left Freeza in a place where he is obviously going to have an impact if the series continues. I am at the point where I always feel apprehensive every time Dragon Ball introduces a new transformation. They start to feel a little throwaway after a certain point because nothing can beat a new enemy unless you figure out a new hairstyle. That’s not the case with Ultra Instinct though, it’s a new form that just works for me in every single way. 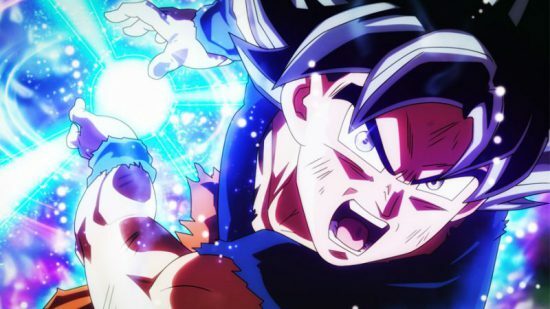 Unlike other transformations of Dragon Ball past, Ultra Instinct feels like it actually transforms Goku entirely, and doesn’t just power him up. The buildup to its first appearance is fantastic, showing just how out of reach Jiren is. Pushed to his absolute limit, Goku almost kills himself and unlocks the new ability, one Whis teased earlier in the series. Then that song kicks in, known as either Kache Daze or Ultimate Battle, it’s a great song that accompanies a complete change in Goku’s posture, fighting style and attitude. I like the design a lot. 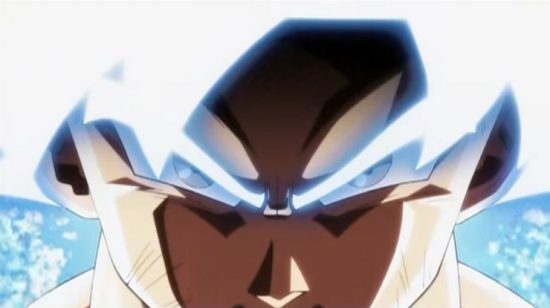 It’s not a whole lot different than Goku in his base form, only with silver eyes, and eventually white hair. The most noticeable change comes from the weird tranquility that comes from Goku when in the form. His movements seem almost fluid, effortless. All while his face becomes a mask, hardly reacting to anything happening around him. It’s simple but incredibly effective. It feels like the animation team put a lot of effort into the scenes that features Goku in the Ultra Instinct form. And gave us some of the best action sequences of the entire series. It was something I genuinely got excited about after my initial viewing, I had it on my mind for the following week non stop. Not since the days of Goku’s very first transformation into a Super Saiyan had I been so excited about seeing a new transformation. Ultra Instinct is really cool and feels like a transformation to get excited about in a franchise already overloaded with transformations and power ups. I only hope that we haven’t seen the last of it already, as Goku mentions that he can’t access Ultra Instinct again after the Tournament is over. I hope the form makes infrequent appearances in the future as Goku strives to attain it again. It shows that Goku still has a ways to go before he journey of strength is over. I like Jiren. I mentioned that before. In my previous post I talked about the reasons Toei fumbled Jiren in the anime. How they caused him to peak early and ended up undercutting his strength as a result. And I’ll be honest, for a while, I was balancing on a knife’s edge as to whether or not I was going to give up on him. It all came down to how they handled him after the tournament was over, and ultimately I was happy with how they parted ways with Jiren. The end of that episode with Jiren still taking Goku out with minimal effort was such a great moment, It was on my mind for weeks. Just how strong was this guy. It’s disappointing that he lulls a bit after this. The eventual reveal of his backstory was pretty underwhelming too. It’s during the final handful of episodes where his character starts to feel redeemed. Backed into a corner from Goku’s mastered ultra instinct form, we start to see Jiren’s actual character. He was scared and he isolates himself because he can’t stand the thought of losing anyone again. And as silly as this may sound when talking about Jiren, being alone had limited him, and its the teamwork between two bitter enemies that ultimately fells him. Jiren becomes more emotive the more he gets pushed, and the Goku effect eventually kicks in. Goku’s love for battle inevitably rubs off on Jiren and he starts to visibility enjoy the battle. This all ends with Jiren opening himself up to his allies in Universe 11, with him and Toppo standing side by side and becoming friends. Jiren was ultimately a very simple character, with a simple story arc. But his design, coupled with the impact he had on the story made me enjoy the hell out of him despite some bumps along the way. On Monday, I’ll put the final part of this little series out. It’ll be a more measured (and hopefully shorter) summation of my thoughts on Dragon Ball Super overall. While I got most of my specific examples out of the way here, next time I’ll give my final verdict. Posted on March 30, 2018 March 29, 2018 by WooderonPosted in Anime, Lists:Tagged akira toriyama, android 17, dragon ball, dragon ball super, freeza, frieza, goku, jiren, master roshi, toppo, vegeta.